Kevin Anderson, Former Virginia Dept. of Alcoholic Beverage Control Special Agent brings years of expertise to the alcohol industry and to ABC Consulting! Mr. Anderson was born and raised in Northern Virginia, where he currently resides with his wife and two small children. As with Crystal Stump, Kevin began working for the Virginia Department of Alcoholic Beverage Control in his high school years as an “Under Age Buyer,” responsible for testing licensed establishments by attempting to make purchases of alcohol. Kevin attended George Mason University, obtaining a Bachelor’s Degree in Administration of Justice, and later obtained a Graduate Degree from the University of Massachusetts. Throughout college, Kevin worked as a private investigator and was later hired as a Tobacco Revenue Agent in the Northern Virginia region. He then was hired by the Virginia Department of Alcoholic Beverage Control as a Special Agent and attended the Central Virginia Criminal Justice Academy in Lynchburg, Virginia. 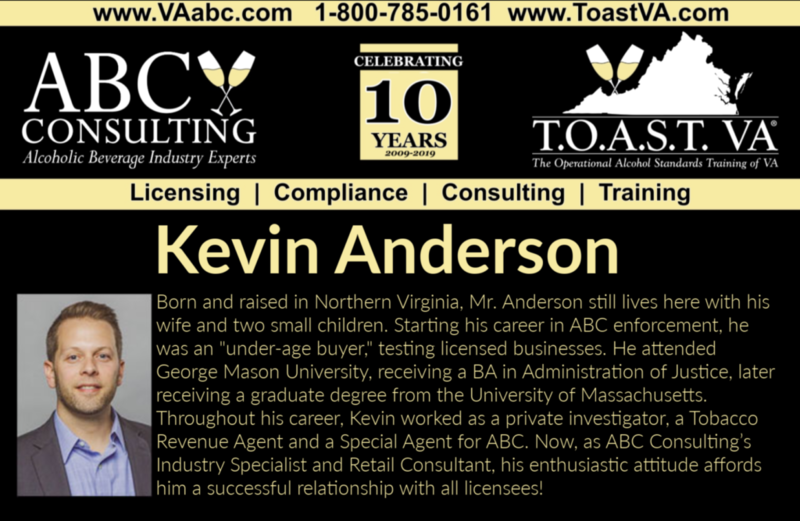 Kevin’s enthusiastic attitude affords him successful relationships with licensees across Virginia as well as other states. He works tirelessly for our Retail and Industry clients, ensuring quick license approval, education of the alcohol regulations, and strategic compliance regarding but not limited to excise tax, label approvals, record keeping, MBAR’s, and hearing preparation. He was instrumental in developing and implementing the First and Only Virginia ABC Certified Seller/Server Training for Brewery Employees called BREW VA™. This training program appears to be the first state approved employee training specific to breweries across the U.S.
North American Sake Brewery, Virginia’s First and Only Sake Brewery – their idea of Sake brewing is nothing short of a love affair. From sourcing the rice to making koji, they hand bottle, putting quality and passion into every single batch. Sensient Flavors Technologies, one of the world’s leading flavor and fragrance manufacturers, offering a multi-sensorial experience, just picked from nature. Loudoun County Brewers Association, educating and informing the community about craft beer. They support new entrants into the market, provide forums for other craft breweries to join and share experiences, and share best practices for complying with all rules and regulations associated with the craft-beer industry. They also present a unified voice to legislators and regulators, in Loudoun County. ABC Consulting is grateful for professionals that are able to teach/support our customers while continuing to find new ways to grow our service portfolio. We are grateful for Kevin Anderson being such a huge part of the ABC Consulting team!